Imran Khan at a July 2018 campaign meeting. 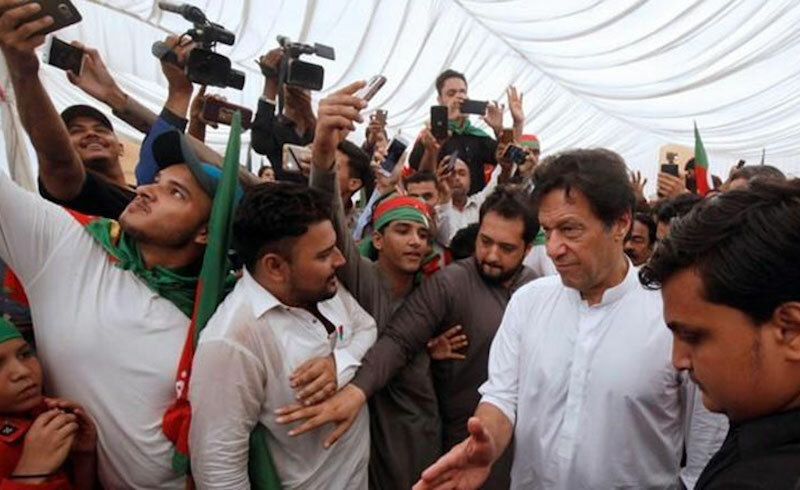 On July 25, Pakistan elected cricketer-turned-politician Imran Khan as Prime Minister, giving his Pakistan Tehreek-e-Insaaf (PTI) a plurality of seats in a hung parliament. PTI took 116 of 272 contested seats in the National Assembly, falling short of a simple majority, which Khan has now achieved with the assistance of smaller religious parties, along with breakaway and independent candidates. The election was notable for the decline of the ruling Pakistan Muslim League (PML(N)), which lost half its MPs to finish with 64 seats, placing it just ahead of the social democratic Pakistan People’s Party’s (PPP) 43 seats. Both during and after the day of the election, nearly every political party contested the results, and accused Imran Khan’s PTI of collaborating with the military to rig the vote. While there is little evidence of direct tampering, it is clear that Khan has reached an understanding with the military to gain power, causing alarm for elite Punjabi political families like the PML(N)’s Sharifs and the PPP’s Bhuttos, which have seen the Pakistani Armed Forces take control on three separate occasions for about a decade each time. Indeed, Shehbaz Sharif of the PML(N) tweeted about “manifest and massive irregularities” and complained that democracy in the country had been pushed back decades. The European Union observer mission saw no rigging, but did note media pressure, “far stronger” than usual efforts to encourage MPs to switch parties, and negative “judicial conduct.” Nevertheless, Khan does appear to have generated real enthusiasm, particularly among the PTI’s young urban middle class base, for his project of a “Naya Pakistan,” which promises an end to corruption, terrorism, tax avoidance, and an increase to human development through an “Islamic welfare state.” Yet his ability to actualise these proposals is stunted by severe economic problems that will likely require a new bailout (and locally imposed budget cuts) from the International Monetary Fund, the fact that he will be forced to work with essentially conservative dynastic elites, and the military’s extremely strong position as a result of Pakistan’s participation in the War on Terror. There are serious issues with the Pakistani economy that are too large to be confronted by any one government, whether civilian or military. About a third of the population, which will reach 200 million by 2020, is impoverished, and on average, the richest 20% consumes about seven times more than the poorest 20%. For decades, Pakistanis have been forced to emigrate to seek jobs and wealth in the Persian Gulf, Southeast Asia, and Western democracies, often sending home money in the form of “remittances” that can be a family’s only chance for class mobility. Often this flight is driven by an overreliance on the agricultural sector, which accounts for 24% of GDP, employs half the workforce, and forms the largest source of exports. The latter tend to be “low value-added” crops, like cotton and rice, through which firms can’t make large profits — the main reason why exports only account for 7.6% of overall GDP, approximately 17% less than the global average for middle income countries. As a result, there is a clear imbalance between Pakistan’s imports, exports, and domestic consumption, resulting in dwindling foreign currency reserves, and a serious overreliance on external financial support. The Central Bank has also devalued the Rupee four times since December, in an attempt to encourage exports and stimulate growth, but decisions like this cannot overcome the economy’s structural limitations. Not only does Pakistan not produce much that foreign buyers want, but what it does produce is rarely taxed to the degree necessary. Less than 1% of Pakistan’s working population — and less than half of the roughly 72,000 firms registered in 2016 — file income tax. Of the firms that did, half didn’t pay any taxes at all. Much public revenue comes through sales taxes that disproportionately affect the working poor. Imran Khan campaigned against corruption, and has pledged to fund social programs by taxing wealthier Pakistanis, but this would require significant restructuring of the tax system that he lacks both the tools and vision to execute. Even if Khan was able to successfully build a new tax system, it is extremely unlikely that he would be able to use it in the manner that he is proposing, due to the requirements of Pakistan’s external financiers. As remittances continue to decline, Pakistan has become highly dependent on bailouts from the International Monetary Fund and close allies and trading partners like Saudi Arabia and China. The IMF has agreed to a dozen bailouts since the late 1980s, and rather than supporting a diversification of the economy and growth in exports, it has pressed for even more privatisation than took place under the neoliberal General Zia ul-Haq (1977–1988). Khan has already begun preparing for mass privatisation ahead of a potential $12 billion bailout that would be Pakistan’s largest ever. Civil servants have written plans to remove government control from nearly 200 companies and put them in a private fund, with the notable inclusion of Pakistan International Airlines, ahead of their sale. Khan may shoot fiery polemics against the treatment of poor and working class Pakistanis, but like his predecessors, he lacks the robust political program that might allow him to avoid enforcing further neoliberalization. Apart from the IMF, Khan’s only options are a cheque from Saudi Arabia, which would come with its own political conditions, or further assistance from China. Chinese funding through a $63 billion investment program known as the China-Pakistan Economic Corridor (CPEC) has likely saved Pakistan from a financial crisis. However, the investments are clearly on Beijing’s terms. Pakistan has become increasingly beholden to Chinese debt schemes, often because CPEC projects require it to use Chinese machinery and contractors. China has also gotten more involved in Pakistani internal security to protect its investments, with Beijing now quietly holding talks with militants operating in Balochistan. Khan is popular for having opposed drone strikes, and US policy in Afghanistan, but he has been basically uncritical or muted about the worrying growth of Chinese economic and security power in the country. These factors, and the nature of the political system in which he must function, will neutralise Khan’s push for reforms. Although Khan rode a wave of discontent against the corruption of established elites, his victory was a result of PTI’s expansion within the existing system, not any challenge to it. Indeed, while PTI managed to distinguish itself from the corruption of the PPP and PML(N), mainly because it has never been in power, Khan aligned the party with many feudal landlords ahead of the election. Landlords are very influential in Pakistani politics, and dominate rural areas with exploitative patronage networks that are negotiated between powerful men. Khan counted on their support to win a majority without allying with the two major parties, in addition to that of numerous political “turncoats,” and a collection of independents and smaller parties. It is worth noting that according to a 2013 study, 45% of Pakistani office holders came from family dynasties, including the twenty-two families that control 66% of Pakistan’s industrial assets. Even if Khan wants to avoid corruption, he won’t have a choice while working with people who are used to the usual way of doing things, and expect governmental spoils in exchange for their political support. Finally, it is worth considering the heavy role of the military in Khan’s election. Khan’s critics have fiercely alleged that the military establishment is responsible for his rapid ascent to power, and there is reason to believe them. Usually, liberal narratives of military interference will include events like the Anti-Blasphemy Protests in November 2017, the widespread abduction and disappearing of journalists and activists that entered a new stage when GeoTV, the largest news channel in the country, was briefly taken off the air in April, and former Prime Minister Nawaz Sharif’s ten-year prison sentence last month at the end of a Panama Papers corruption case, which was widely seen as politically motivated. While these events all reflect the Pakistani Armed Forces’ interference in the political process, it is rare for commentators to critically discuss the massive impact of recent anti-terrorist offensives like Operation Zarb-e-Azb. Since mid-2014, after failed peace talks that led to renewed attacks, Pakistan has been launching military offensives on growing sections of the country: the northwest borderland with Afghanistan in particular. The operations have been extremely popular, including among many of Khan’s current critics, who called him “Talib Khan” for his positions on negotiation. They also gave the military a new sense of confidence. After Zarb-e-Azb, the military was able to rehabilitate its public image following the dictatorship of Pervez Musharraf, and expand its reach on the back of an extremely aggressive anti-terrorist nationalism. This continues a longstanding trend of the increasing “securitisation” of Pakistani society. Predominantly lower middle class militant groups like Tehreek-e-Taliban Pakistan and Lashkar-e Jhangvi have managed to reshape political life with spectacular attacks that terrify the population and push the state into iron-fisted security policies. The military response has led Pakistan in an authoritarian direction, through policy decisions like lifting the suspension of the death penalty. It’s not shocking that the military has become bold in subverting civilian governance. Even a thriving democracy would have trouble preserving itself during a war against terrorists, which by its nature requires illiberal politics, and a security mindset through which warfare is the only solution. There is still cause for hope. The fact that PTI continues to attract a loyal following in Karachi and Khyber-Pakhtunkhwa points to a potential shift in the otherwise sectarian nature of politics in these areas. No leader, however, will be able to fundamentally reshape the country as long as the economy is choked by structural limitations, and the military is able to exploit the War on Terror to bolster an anti-democratic outlook. The most hopeful story from the election is actually from South Waziristan, often called “the most dangerous place in the world,” where the socialist independent Ali Wazir contested and won a seat. Figures like Wazir, and the Pashtun Protection Movement to which he is affiliated, hold the best prospect of fully democratising the country. Imran Khan is merely a footnote to their more compelling story.